Andrey Filatov is an entrepreneur, philanthropist, and passionate art collector. Born in Ukraine, he went on to study in Belarus, earning a degree as a chess coach from the Academy of Physical Culture and Sports in Minsk. After the collapse of the USSR in 1991, and with the prospects for becoming a professional chess player dimming, Andrey and his partners founded N-Trans, today Russia’s leading infrastructure group. In 2014, Andrey was elected the President of the Russian Chess Federation and Vice-President of the international chess organisation FIDE. Both before his appointment and in his capacity as President, Andrey has actively sought to develop the strong links between chess and art by bringing world class chess tournaments to leading museums – a programme started in 2012 with the World Chess Championship hosted at the Tretyakov Gallery in Moscow followed by a chess competition at the Louvre in Paris. Since January, 2016, became senior trainer and captain of the Russian men's chess team. In September, 2016, the Russian team won bronze medals at the42nd Chess Olympiad in Baku. 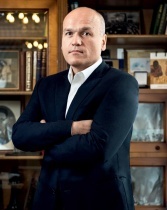 Andrey Filatov is actively engaged in philanthropy and supports Russian literary and artistic societies, as well as sponsoring a number of educational programmes.